TL;DR: The impact content has on encouraging prospects to apply is actually measurable, giving you a chance to show exactly how powerful and valuable your recruiting content is. 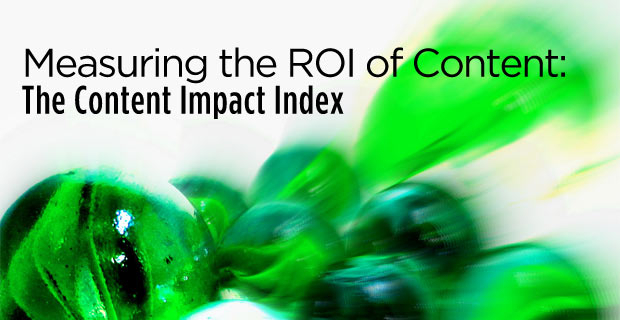 We call it the Content Impact Index. We’ve long championed the power of content in attracting talent and in convincing interested candidates to apply. You can’t rely solely on your job descriptions to do that for you, so you need content. Up until very recently, this idea had been held without proof. It simply made sense that you needed more to compel the best people to apply. But all that changed when we published a case study in ERE.net in which we proved that content had a number of positive effects on the number of applications. Specifically, we were able to show what kind of impact content had on a specific job role or group of job roles. Here’s a quick re-cap of that study: Content played a small role in the aggregate, but had a much greater impact for roles requiring ten or more years of experience: people for those jobs were almost three times more likely to apply if they interacted with content. In this post, we’d like to explain how we measure content’s impact with a metric we refer to as the Content Impact Index (CII). Put simply, we use this number to compare the lift (positive or negative) content made on a specific job, and, with access to your web site analytics, you can too. That is, if the apply click ratio for all visits that touch your content is 4.2% and your apply click rate for visits that ignore content is 3.7%, you have a CII of 1.13. That is, people who interacted with content were roughly 13% more likely to apply. Conversely, if you have an apply click rate of 4.2% with content and an apply click rate of 4.9% without it, you have a CII of 0.86, meaning that people seeing content are approximately 14% less likely to apply. This is good to know, especially if you’re trying to show someone that content had an impact and return on investment. It gets even better if you start thinking in segments. There are three ways to think about the traffic to your career site. First, you can think of it as one huge mass of visits. I would bet that most of your reports probably define all your data and KPI’s this way. This is the easiest way to think about data, but you lose a lot of potential insight when everything is aggregated together and averaged. If the average shoe size is 8, you aren’t just going to make size 8 shoes. That misses out on the fact that most men wear something closer to a 10 and most women wear something closer to a 6. Averaging things out ignores all those variations. This is how you explain the power of content to anyone, including your boss. Second, you could think about your traffic as a million (aspirationally) people individually. This is a far more accurate way to look at information, but it forces you to lose sight of the bigger picture. Trying to envision a hundred different people’s paths and intentions as they go through your site is mind-boggling, and it won’t scale to your actual traffic size. You’ll miss the forest as you count the leaves on the trees. But there’s a middle ground in the shape of segments. This third way lets you create groups of like visits to help you understand the bigger picture. For example, if your CII for your whole site is 1.01, that means content increased the likelihood of someone applying by about 1%. But did content impact all people the same? If you have a hospital, did nurses, doctors and admins all react in the same way to your content? Put differently, if you built a lot of content around hiring sales people, wouldn’t you expect to see a higher CII for sales jobs? If you aren’t, there might be a crucial flaw in your content marketing strategy. This is the kind of thinking and reporting that will help you explain the power of content to anyone, including people (perhaps your boss) who need to see the direct ROI before giving you the resources to tell your story to the world.